Automation can be incredibly beneficial when applied to a small business. Accounting software for small businesses can help when you bring taxes or other accounting jobs to CPA firms in Las Vegas because they can import your files into their systems, saving time and effort. However, there are some important factors about using accounting software that you should be aware of before you buy. 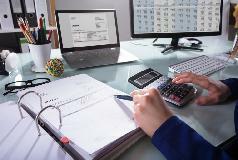 Here is more information about automated accounting software for use in your small business. Relying on a program can sometimes result in accounting errors if there are mistakes in data entry. These errors can make working on your files difficult for your CPA and your clients, not to mention you. Keep this in your mind, and be sure to make it a habit to thoroughly review the reports on a regular basis, keeping an eye out for errors. There are many benefits to using a software program to maintain your small business accounting. One thing you can expect is a spike in productivity because accounting software programs can free up significant time by automating accounting functions. Automation frees you up to focus on other tasks so you can get more done in your busy day. As mentioned before, you need to remember there are pros and cons any time you decide to automate a task. Though there are plenty of benefits to using accounting software, you will want to keep an eye out for unintentional problems. It is important to remember that a program is limited to the quality of the data you input. Errors will no doubt happen every so often. But in general, using software to automate routine tasks helps businesses function more effectively. As they improve your productivity, they let you focus on the more important tasks in your small business.